A sold-out world tour. Twelve nights at the O2 Arena. No wonder Richie's a happy man! Two years ago, Bon Jovi's Richie Sambora sat down with MusicRadar for an extended podcast interview during which he graciously answered questions from readers. Well, some of them. The number of responses from MusicRadar viewers was so overwhelming that there was no way we could put all the questions - even ever a quarter of them - to Richie. But we're going to try again. 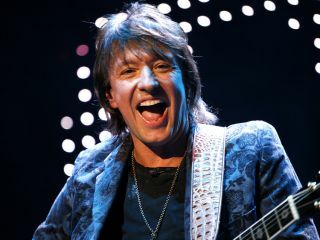 In a little over a week, Sambora is going to hang with MusicRadar for another comprehensive interview. We'll talk about Bon Jovi's latest album, The Circle, and the massive 18th-month tour that will see the pride of the Garden State play three dates at the brand-new Meadowlands Stadium (in New Jersey, natch) along with - get this! - 12 dates at London's O2 Arena. We'll pick the very best questions and ask them during the interview. Good luck!